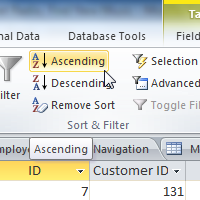 Access 2010 gives you the ability to work with enormous amounts of data, which means it can be hard to learn anything about your database just by glancing at it. Sorting and filtering are two tools that let you customize how you organize and view your data making it more convenient to work with. In this lesson, you'll learn how to sort and filter records.